Mohamed Kallon has told BBC Sport that he provided about US$40,000 for Sierra Leone's preparations ahead of Saturday's 2010 World Cup and Africa Cup of Nations qualifier. Earlier in the week the Leone Stars coach Ahmed Kanu said that the squad had not received any financial support for the game against Equatorial Guinea. Kanu had been expecting help from either the Sierra Leone Football Association (SLFA) or the government. 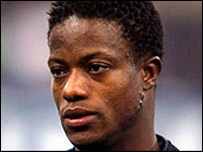 Kallon, who has just moved to Al Sha'ab in the United Arab Emirates for an undisclosed fee, said he had no choice but to provide the money. "If we say we'll wait for the SLFA and government to give us cash, perhaps it'll come a day or two before the game and it'll badly affect our preparations," the Leone Stars captain said. "So, I was left with no choice but to step in and rescue the situation. "This is a way I can help my country, I love my country and I want us to advance to the next stage of the qualifiers." The striker explained how he had spent the money. "US$24,000 of the cash I provided was used to purchase the tickets of the foreign-based players excluding me, US$6,000 was used to pay the hotel for the team for five days," he said. "US$10,000 will be spend on feeding and other things and I'm envisaging having to spend more." An executive member of the SLFA, Alhaji Unisa Alim Sesay, said that they would refund all the money despite Kallon saying that he does not need to be paid back. "The president of the SLFA, Nahim Khadi, too has spent his personal money on the team," Sesay added. A government official at the sports ministry also said the Sierra Leone government will be providing some money for the preparation even though it would be arriving late. This is not the first time Kallon has provided financial assistance to Leone Stars. He helped finance the team for their 2010 World Cup preliminary round games against Guinea Bissau late last year.